A bamboo toothbrush for children. Sustainable, BPA free, Fair traded and vegan friendly. 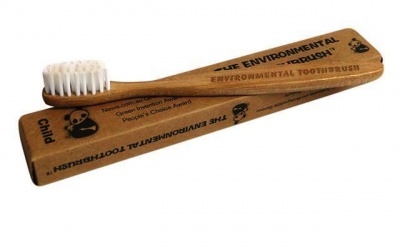 A bamboo toothbrush, with soft bristles for children. BPA free and Fair traded and vegan friendly. The handle is made of MOSO bamboo, an environmentally sustainable timber. Bamboo needs no pesticides or fertiliser to grow. It's a super fast growing grass that is more efficient at taking CO2 from the air and producing more O2 than trees. This bamboo is cultivated for between three to five years, and then harvested. It re-generates itself naturally, with minimal rain and without the need for harmful pesticides. In fact, by harvesting and using the bamboo, it helps to control unwanted spread into agricultural and natural forest areas. The bamboo is grown by many local farmers (NOT PLANTATION). 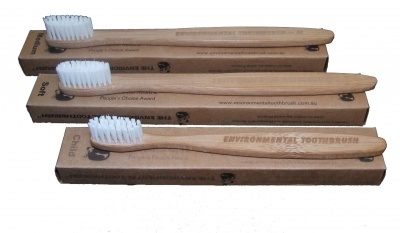 The bristles are made from a BPA FREE polymer resistant to microbial growth during normal use, to ensure safety and durability. For best results, most dentist's recommend you replace your toothbrush either monthly or at least every quarter some even say use it until it stops. To answer the main question, HOW LONG DOES IT LAST? - We test drove a toothbrush for over 8 months so yes they last (not that we suggest you do that). Because the Environmental Toothbrush does not come in a variety of colours, you need to customise your toothbrush to differentiate yours from others in the household. We recommend writing your name in pencil on the handle, or being creative and decorating your toothbrush to suit your personality.